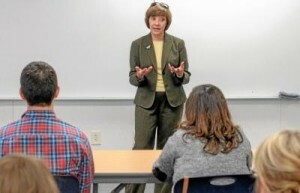 California Department of Food and Agriculture Secretary Karen Ross spoke to students at the California State University, Chico Farm on Tuesday. Ross was in Chico as guest speaker at the Chico Rotary Club and she toured the University Farm before meeting with students and local ag leaders. “We need to reconnect farmers with consumers and create an ag-literate populace,” said Ross. One student asked about a recent proposal by the governor to eliminate grant funding for FFA agriculture education. Ross said students can send a powerful message; those in the FFA blue jackets can and should stand up at school board meetings and talk about the importance of investing in youth. “What about conflicting messages that come from various sectors of agriculture?” asked Dave Daley, an instructor at Chico State. Ross said there is room for many different segments of the food industry — organic and conventional and all the variations in between. For students wondering which direction to go with after college, Ross encouraged young people to consider careers with CDFA and USDA. For any ag producers, it’s important to be able to communicate and to clearly express themselves through writing, she added. The stories of the farm cannot be told in 140 characters, the length of one Twitter entry, and the ability to communicate science to non-farmers will become increasingly important. Ross also noted that farming has always included adaptation; as the world population increases and open land decreases, improvements to farming will continue.